Forgive me Bloggers, my last post was 35 days ago. I don't know where the time has gone, but I hope to never let that happen again. Now that I am absolved, I can start afresh. The holidays have passed, the New Year has started, I am running again (yay!) and we have someone new in our lives. This little someone came as a surprise during the holidays. This little someone fills a void that has been in our lives for years now. You can't look at or think of this little someone without a huge smile taking over your face. Who is this wonderful little someone? It's Sticky Chicken, of course! Sticky Chicken is the distant cousin and successor of Sticky Lizard. If you don't recall Sticky Lizard, take the time right now to read about him. It will explain alot and save me some typing time right now. The upshot of it all is that Sticky Chicken is a blessing and a curse. When he's with us, he'll travel where we travel, do what we do. He'll occasionally appear in family photos, partake in family events. Then we pass him back from whence he came...the boys' prankster cousin A. This is the blessing part - giving him back in a most unsuspected way, stashed into a suitcase, slipped into a handbag, tucked into a coat pocket. The curse part is knowing that some day, somewhere, when our guard is down and our memory is failing us, Sticky Chicken will come back to us in an equally surprising manner. I have to report some unfortunate news about Sticky Chicken. He had only been in our possession for about 8 minutes when, I can scarcely say it, he lost his feet. Yes, in a matter of seconds, Sticky Chicken became a double-amputee. It was horrifying. 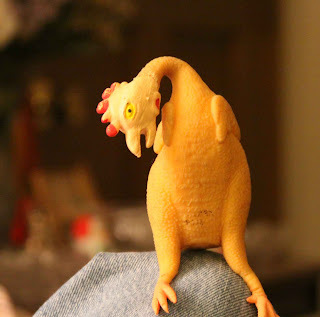 My youngest son was harmlessly (or so we thought) holding Sticky Chicken by both feet, chicken legs stretched apart, while spinning his sticky body, winding it up tight at the ankle. Unexpectedly, Sticky Chicken flew through the air, permanently severing the connection between legs and feet. My son was left stunned with Sticky Chicken's feet in his hands. Looks like he might be on the fast train to oblivion, just like Sticky Lizard. 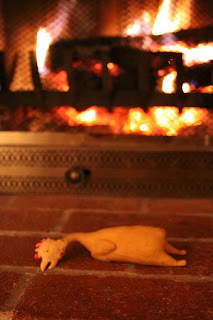 In the meantime, aside from his injuries, Sticky Chicken is well. He enjoys lazing by the fire, watching YouTube videos and is thinking about getting on Facebook. Your description of the feet coming off is the funniest thing I've read in a while. Thanks for a great laugh! -Marilyn L.
Cannot stop laughing! Great writing. And...I can help sticky chicken! I'm an OT and my first client had bilateral amputations! Have fun in DC. p.s. I still don't see your mileage tracker back! Well, the prodigal son returns home. Glad to hear that Sticky Lizard II has finished his gap year abroad and then some. I am anxiously waiting to see where he turns up next!